"[Bahamut Lagoon] is an RPG in that you walk around places and talk to people, buy things, and the like. The battles are also kind of like Final Fantasy VI. Unlike FFVI, however, you get to control multiple parties and move them around maps to attack enemies strategy game-style. A cool feature of this game is that you can alter the maps to your advantage (or disadvantage). If the enemy's in a forest, light the forest on fire and they'll receive damage as long as they stay there. Destroy bridges, create ice walkways, destroy walls, and more. Another cool feature is a New Game + type thing. After you finish the game, you can start over with all your stats and items! With that, and the extra bonus dungeons (which can be really hard), you'll be spending a lot of time playing this game. Square does a lot of nifty effects to achieve some of the best SNES graphics ever. It's certainly one of the prettiest 2D RPGs out there, and the battle animations... well they're just sweet. You'll think it's a PSX game or something." 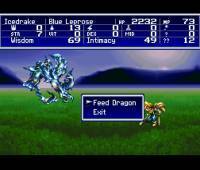 If you enjoy console-style RPGs in general, Bahamut Lagoon is a must-have. If you dislike console games because you think all of them have shallow gameplay and offer no challenge, Bahamut Lagoon is the one game that will change your mind. Two thumbs up, and a deserved entrant into our Hall of Belated Fame.